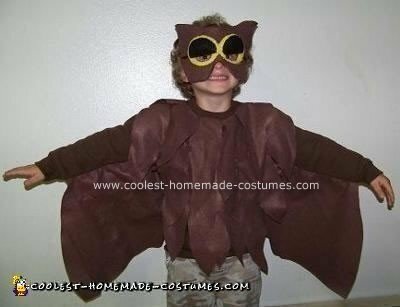 This owl costume I made for my son to dress up in this fall. In this moment in time he really wants to know about animals and seasons of the years. He just started kindergarten and is 5. My son has show- n- tell on Mondays and wanted to bring a owl but we don’t have an owl so I took a sweatshirt sewed some felt feathers (I just drew a shape of a feather on a cereal box and used it for a template)onto the front of the sweater and large squares in the armpit of the sweater to make wings then rounded it to a feather tip. I used a cereal box more felt and some ribbon to make the mask just drew on the card board then put the felt on the front and back of the mask. For the eyes I made big circles and stuffed them with more felt scraps and cut holes so my son could see tied on ribbon and, tah dah, there is the owl. My son is 9 years old and has been given a school assignment that requires he act and dress up like the main character in a book. The book he is reading is “The Capture” – about owls, apparently! We checked the local party supply/costume store, but no luck. Then I tried the internet. After printing out your (Anderson’s) costume, we headed to Wal Mart on the way home from hockey this afternoon and purchased felt, sheets of colored foam, some real feathers and a very inexpensive long-sleeved brown shirt! Our costume is almost finished! I am very grateful to you for taking the time to make your creation available for me to use. I am not that crafty or creative!! !